A highly recommended read not only for swimming afficionados! This fascinating and deeply inspiring book by Glenn Stout, published only recently in July 2009, was given to me by a friend visiting Heidelberg this month. I swallowed it within a few days. 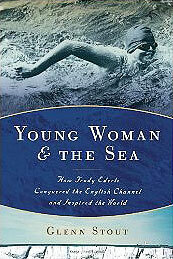 It is an extremely lively, detailed and gripping account of how Gertrude Ederle, of German (Swabonian) descent, but born in the U.S., became the first woman to swim the English Channel in 1926 – and thus paving the way for a new role and recognition of women not only in sports but also in society. As opposed to today, most of the attempts at that time and also her successful swim started from Cap Griz Nez, France, the closest point to England. On her successful swim on Aug. 6, 1926, a new route was tried out, which allowed her to start from a sandy beach in the calmer sheltered waters a little west of the Cap. Her previous attempt the year before had failed because her trainer Jabez Wolfe had terminated her swim by sending another swimmer in to touch and thus disqualify her after nine hours in quite difficult conditions. But there were even rumours of deliberate food poisoning. This time again, the boat pilot wanted to terminate the swim when things were getting critical. The boat, pushed by the tides, was getting dangerously close to the Goodwin Sands east of Dover and Deal, where the boat could have stranded. Finally, however, Trudy’s father, who was on the boat and knew Trudy was doing fine, was able to convince the pilot to change course to avoid the Goodwin Sands. For Trudy this meant swimming against a very strong tide for quite some time. But she was confident, determined and steadily moving forward – finally landing in Kingsdown between Deal and Dover at 9:40 p.m. at night in an amazing 14 hours 31 (or 39?) min! 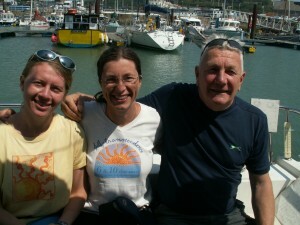 Not only did she become the first woman to conquer the English Channel, but she even beat the men’s record by two hours! Back in New York she was received like a star – but 2 of her records did not stand for long. She had opened new doors – and soon others were to follow: only 3 weeks later the next woman, Millie Clemington-Corson, succeeded, and three more men were to do it by September 1926 – each one faster than Trudy, but definitely helped by her achievement. For Trudy also pioneered a more efficient and faster swimming stroke than was common at the time – the front crawl. Breaststroke and the “trudgeon” had been the prevalent strokes of those days. Gertrude’s female record, however, was only bettered in 1950 by Florence Chadwick, another swimming legend and 4x Channel swimmer, who made it from France to Dover in only 13:23 and became the first woman to swim the Channel from Dover to France in 1951.